MyBirthdaySupplies E-Gift Vouchers are a great way to show your friends and family how much you care. If someone you know is organizing a birthday party, it would be a lovely gesture to send them a gift voucher to allow them to buy an appropriate gift for themselves on your behalf. Giving an E-Gift voucher is easy. Simply fill in the details like the recipient’s name and email Id in our form with a special message from you. They will receive the email and can shop for any products on our site within the range of mentioned gift amount. Once your recipient receives the E-Gift voucher he/she will be immediately able to use it for shopping. An easy way to gift, no need to go shopping! 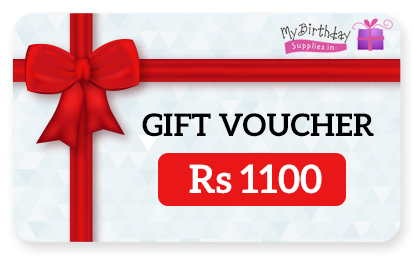 E-Gift voucher value can be anything between Rs.1100 and Rs.5100. The E-Gift voucher will be delivered via email. Recipients must create a free account at mybirthdaysupplies.in to redeem the E-Gift voucher. Every E-Gift voucher has an individual code. To redeem the E-Gift voucher, the user must enter the code in the shopping cart after selecting the products. Recipient can use both - an E-Gift voucher and credit card to pay for the order. If both are used, we will charge the E-Gift voucher first and the remaining balance will be charged to the credit card. Unused E-Gift voucher will not be redeemed for cash. E-Gift voucher cannot be replaced if lost or stolen. E-Gift voucher can be redeemed within a year from the date of purchase. E-Gift voucher can be redeemed only for orders shipped in India.